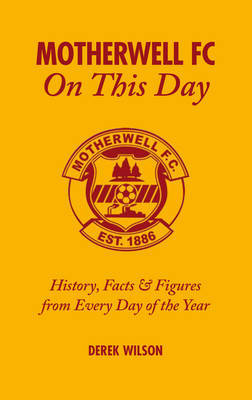 Motherwell FC On This Day revisits all the most magical and memorable moments from the Steelmen's rollercoaster past, mixing in a maelstrom of quirky anecdotes and legendary characters to produce an irresistibly dippable diary of claret-and-amber history - with an entry for every day of the year. From the club's Victorian formation through to the SPL era, the Fir Park faithful have witnessed Scottish League, Cup and League Cup triumphs, promotions and relegations, hard-fought Lanarkshire derbies and unforgettable European nights - all featured here. All-time greats including Ian St John and Andy Paton, Willie Pettigrew, Davie Cooper and Willie McFadyen all loom larger than life. Revisit 16 April 1932, when the championship was all but guaranteed with a win against Cowdenbeath - and McFadyen notched his historic 50th. 19 April 1952: 136,274 watch the Steelmen lift the Scottish Cup at Hampden. Or 29 May 1977, the little-known occasion when Well thrashed Ajax 4-2!